Military Service Day – Free admission for all Veterans, active duty military personnel, and their families today. Arrive at 9:00 a.m. for a 9:30 a.m. program honoring all branches of the military. 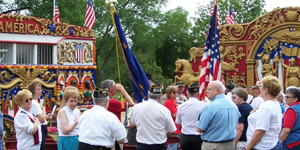 Patriotic themed circus wagons, military and veteran guest speakers, vocalists and more for this ½ hour program. Help us honor these brave men, women and families while spending a fun-filled day at Circus World.